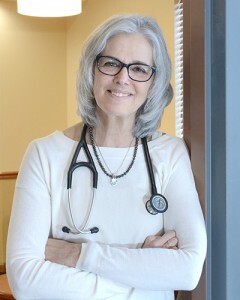 Dr. Migden’s first career was in psychology, during which she worked with children and adolescents, many of whom had disabilities and special needs. This experience laid the foundation for her progression into medicine, as she observed the need to develop unique learning strategies which optimized an individual’s strengths to compensate for deficits. She developed screening tools for children as young as 3 years, in order to anticipate how best to individualize learning, enhance self-esteem, and thereby optimize the likelihood of high school graduation. She also learned the value of working with students and their families over the course of their entire school careers, which allowed for continual reassessment and refinement of programs. This was instrumental in her decision to change careers and choose a specialty which allowed her to follow individuals and families over their lifetimes. The oldest member of her class, Dr. Migden entered Albany Medical College in 1984, while raising 2 small children. She was awarded the Albany County Award for Academic Excellence when she graduated in 1988, embarking on a four year combined residency in Internal Medicine and Pediatrics. She has remained continuously board certified in both Internal Medicine and Pediatrics, always with a special interest in the disabled and the elderly. Over the course of her medical career, she has worked for local hospitals as well as run her own practice, Altamont Internal Medicine and Pediatrics. She has mentored medical students and collaborated with Albany College of Pharmacy, providing residency experience for post-doctoral pharmacy students. Always interested in individualizing care, she co-authored articles on complementary therapies and worked with residents in developing strategies to enhance compliance with medication and other treatments. Dr. Migden chose to join Oldendorf Medical Services in January, 2017 because she was looking for a practice that values individualized care, long-term relationships with its patients, and adherence to the most up-to-date standards. She continues to welcome all of her “old” as well as new patients.